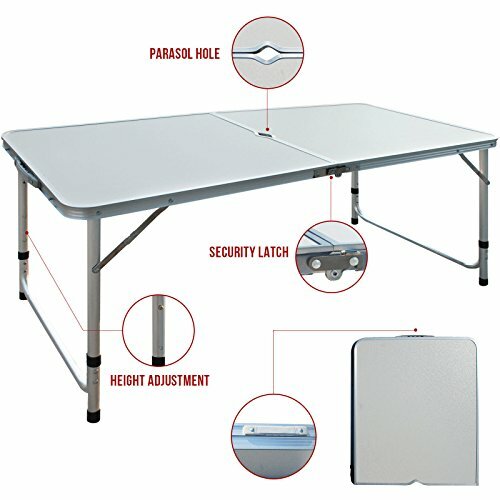 This folding aluminum Camping Table is ideal for indoor or outdoor recreations such as picnic, camping, BBQ and party. Folded in half, this table is easy to storage and transport. With the adjustable legs for height adjustment, the table offers great convenience to use in different environment. Color: Off White Material: Powder Coated Steel Frame & HDPE Table Top Overall Dimensions: 48'' L X 24'' W X 28.4" H Folded Size: 24" X 24" X 3"
This Is Our 4Ft Portable Multipurpose Fold In Half Table, Which Is Ideal For Family Reunions, Picnics, Camping Trips, Buffets Or Barbecues. The Folding Table Is Of HDPE Table Top Powder Coated Steel Frame.So It Resists Spills And Weather And Sturdy Easy To Clean.Because Of Its Foldable Top And Legs, It Can Saves Space And Time As Well As Convenient To Transport And Store. Buy It, Enjoy Your Family Reunions, Picnics, Camping Trips, Buffets Or Barbecues! If you have any questions about this product by Restonc, contact us by completing and submitting the form below. If you are looking for a specif part number, please include it with your message.